Panton Chair (mspantonchair) at Pure Design / Seating / Dining ::: Furniture for the Home, Office, Home Office, and More at Pure Design Online! Do you remember the chairs you grew up with? We believe that a great chair creates wonderful memories. 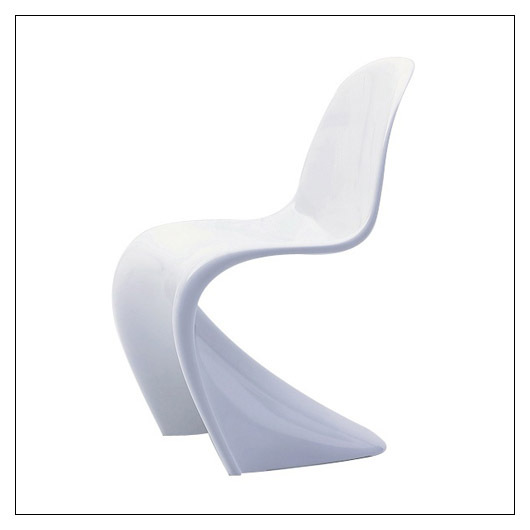 The Panton Chair is an unforgettable chair your kids will always remember. In the early sixties, the Danish Designer Verner Panton together with the Vitra Development Team, realized an idea which had preoccupied him for many years. The idea was to produce a plastic chair from a single moulding. In 1967, the Panton Chair went into mass production. It was immediately regarded as a sensation and received critical acclaim. Vitra has recently re-introduced this design icon in reinforced polypropylene, which makes for a durable chair that is stable, easy to clean, and can take lots of abuse from Mini! This expressive chair fits well with any table and is also a great solution for outdoor living because of a special additive used to prevent early fading. Made in Germany by Vitra. **Tip: Durable and fade resistant, this chair is suitable for inside or outside use.